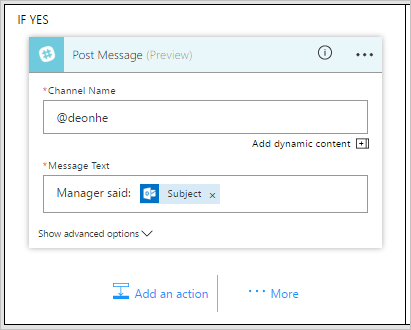 Create a flow from one of many built-in templates that can, for example, send you a Slack message when your manager sends you an email in Office 365. Note: Create a flow from scratch if you already have a process in mind and can't find a template for it. 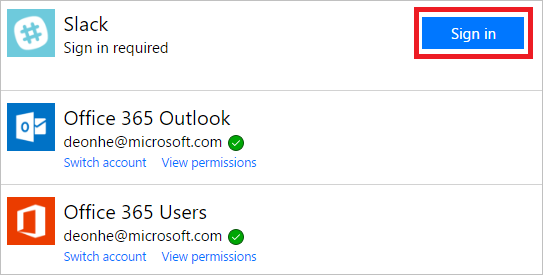 In flow.microsoft.com, select Templates in the top navigation bar. In the search bar, type Slack, and then select the search icon. You'll see only templates related to Slack, so you can now select Send a message on Slack when my manager emails me. Confirm that this template will do what you want, and then select Use this template. If you aren't signed into Office or Slack, select Sign in and then follow the prompts. After you confirm your connections, select Continue. Your flow appears, showing each action with an orange title bar. Select the title bar for an event to expand it, and then customize it (for example, by specifying a filter on the email that interests you). Actions that require input from you will automatically be expanded. For example, the Post message action is expanded because you need to enter a channel, such as your @username. You can also customize the message content. By default, the message will contain just the subject, but you can include other information. Near the top of the screen, specify a name for your flow, and then select Create flow. Finally, if you're happy with your flow, select Done. 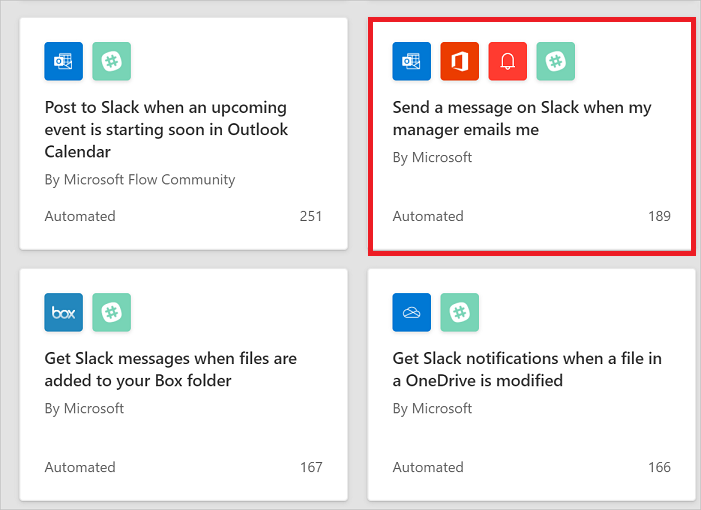 Now, when your manager sends you an email, you'll receive a Slack message that contains the information that you specified. 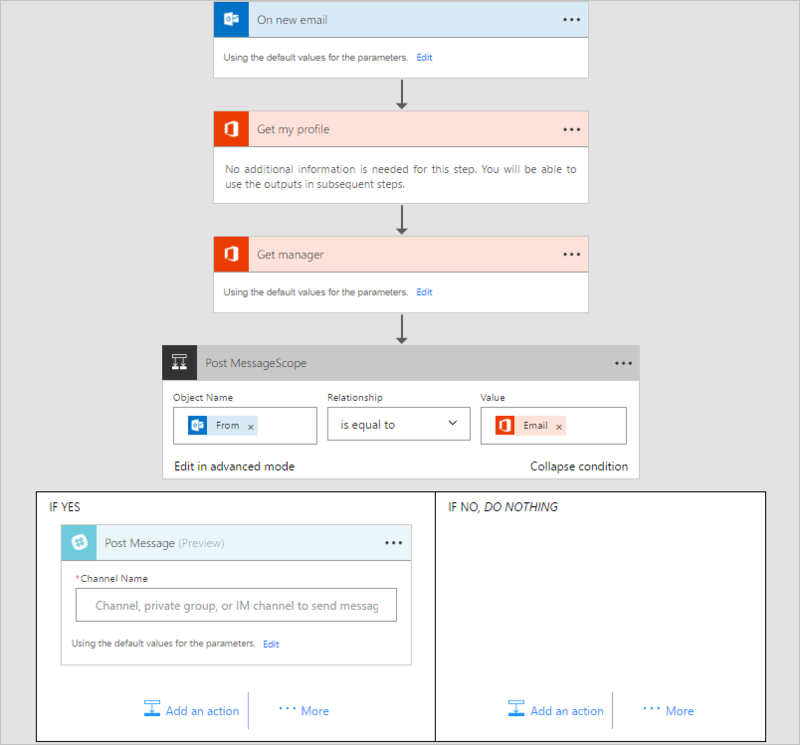 Get started with team flows and invite others to collaborate with you to design flows.